High-quality, best resume templates, professionally designed Photoshop, Illustrated and word format easy to edit cv/resume templates. We take a unique approach to boring business documents, creating modern, sophisticated and easy to use resume templates just for you! 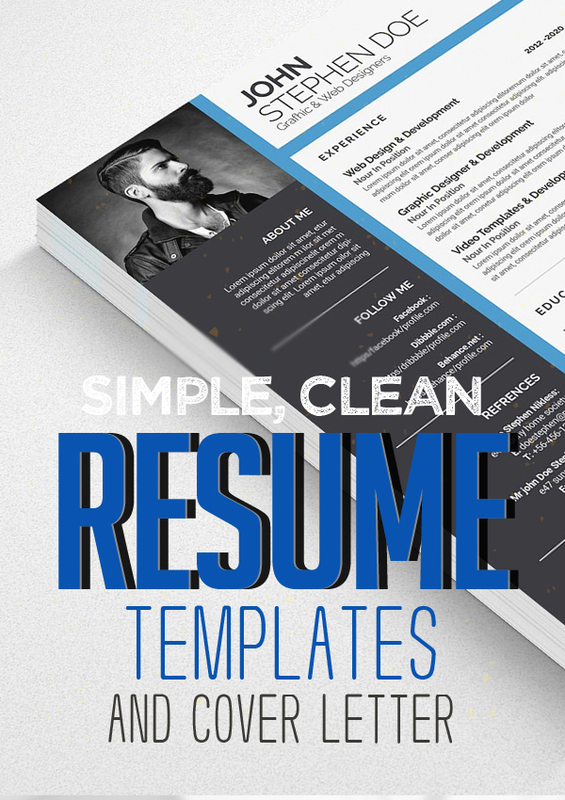 Simple and clean resume template make a remarkable first impression – after all you only have one chance when applying for a specific job, so make the most of it! 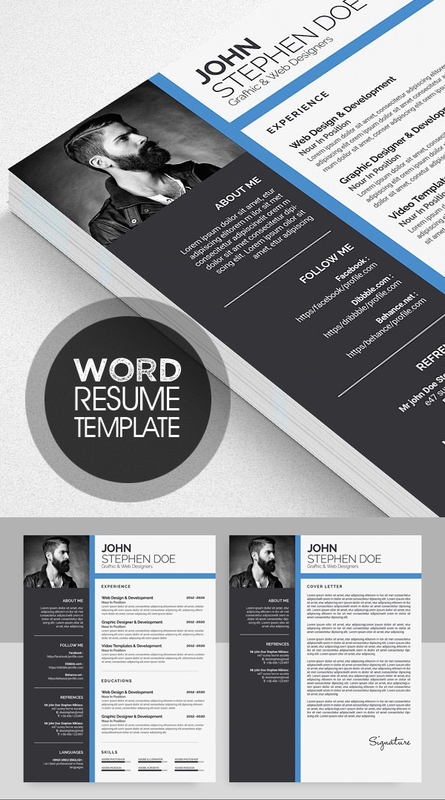 New resume templates that will make your resume stand out from all the others. I focus on creating a traditional, elegant template with a splash of modernity. The design is specifically tailored to catch the eye of a hiring manager, with more than enough space for your own text. In need of a great resume design but lack the skills to design one or simply don’t have access to expensive design software? Experience why over 11.000 fellow job-seekers are using Resume Cover Pro as their one-stop solution for creating a job-winning resume with Microsoft Word. Download the Digital file for a professionally designed and easy to customize 1 Page Resume Template, One Page Cover Letter Template ( Included Bonus 30+ Icons Pack). You receive 2 Unique pages! You can use these templates for years to come, and change the colors and fonts if you would like to give it your own unique personal touch. Creative Minimal Resume with 2 Pages. Template is editable text, colour & resizable/scalable vector based designed in Adobe Illustrator, Photoshop & Microsoft Word. It’s fully editable, customisable & scaleable without losing resolution. Ready to print with professional template setup with CMYK, Layered, 300DPI, Bleeds & Safe Guides, Trims and free font. Download the Digital file for a professionally designed and easy to customize 1 Page Resume Template, One Page Cover Letter Template (Bonus 30+ Icons Pack). You receive 2 Unique pages! You can use these templates for years to come, and change the colors and fonts if you would like to give it your own unique personal touch. Professionally designed Microsoft Word resume template. Download for Microsoft Word users to use to create a best resume in minutes. Easy to customize and ready to use template. High-quality, professional templates that are unique in creativity and help you to get your dream job. Downloading the file will allow access to your professionally designed, 2 page resume template + cover letter + references. The template can be easily customized to your liking and includes all necessary files for a quick set-up. Delete or add anything you desire in the document, change colors or simply keep the original design. 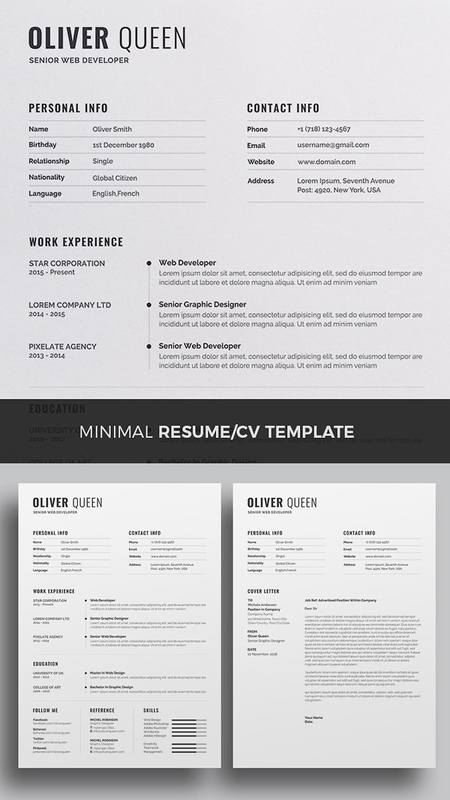 Make a positive impression with this simple and clean 3 pack resume template. With a strong emphasis in typography, this template will present your information concisely in a layout that is pleasing to the eye and easy to read. This minimal, bold and modern design will highlight your most relevant features to get you noticed and create a consistent voice of your personal brand in all communications. The Ultimate Resume allows you to create your own personal brand logo in just a few minutes, just use any one from this 12 logo which already include in main file. The Ultimate Resume Builder is a bold dynamic, strong typographic and professional template designed to make an impression. Make a positive impression with this simple and clean resume template. With a strong emphasis in typography, this template will present your information concisely in a layout that is pleasing to the eye and easy to read. This minimal and modern design will highlight your most relevant features to get you noticed and create a consistent voice of your personal brand in all communications.. The resume have a very organized and named layers, really easy to customize.